The St. Croix Room is located on the B&B’s lower, walkout level. It has two entrances, one from the B&B’s Entertainment Room and the other through a private entrance from the patio. The view is of the pond, Grace Lake Too, and a fern-filled yard. 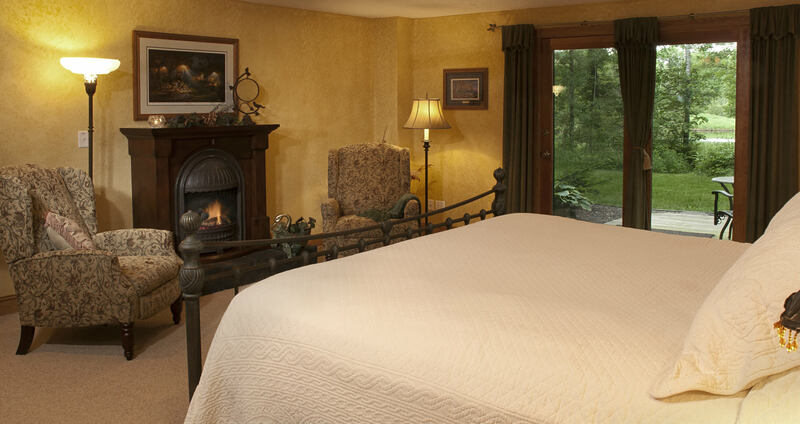 The room features a king-size bed and an electric fireplace that has a wood surround with an older Victorian look. The fireplace is flanked by two wing-backed chairs. 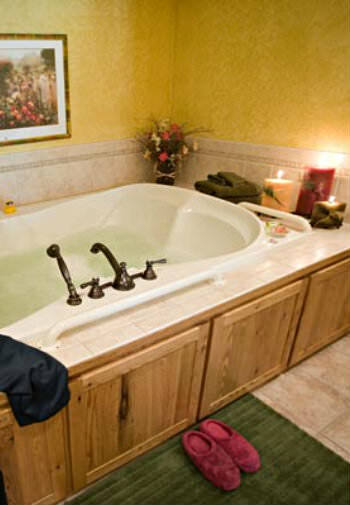 A main feature of the St. Croix Room is the private bath with a huge whirlpool tub and separate, two-headed shower. Refreshments are available at any time from an in-room refrigerator that is stocked with complimentary bottled water, soft drinks and wine, plus a Keurig Coffee Maker. See how the St. Croix compares to the other B&B rooms.